Thomas lived in Laugharne between 1949 and his untimely death in 1953. There are two main aspects to the attraction; one being the Writing Shed and the other his actual residence, The Boathouse. As you follow the well signposted route along the coast, you will arrive at the Writing Shed first. The old WW1 shed is not open to the public. You can, however, stare at his writing desk through the window. It’s basically a small garage, so having people tramp through the tiny space would ruin it pretty sharpish. You don’t have to cross the door to realise just how peaceful a spot it must have been for Thomas. The Boathouse is a pretty small affair, with a cafe and deck, a garden, a parlour and a single upstairs room. The parlour and upstairs room, which have information panels, video and audio commentary are the only fee paying parts of the attraction. It’s £4.30 for an adult ticket and, to be honest, I didn’t get *that* much out of it. The overall attraction is wonderful; don’t get me wrong. It’s just that the two rooms I paid to see were far from the highlight. The coastal walk towards the Boathouse offers incredible views of the Taf estuary and the Gower. The pretty gardens and back deck in the writer’s residence are completely charming. The main draw of the visit was Thomas’ Writing Shed, which sits separately from his main home. It should come as no surprise (except it really did because I hadn’t thought of it before I arrived…) that Dylan Thomas is buried in the place that provided him with so much inspiration. Thomas died while on a book tour in New York, aged just 39 years old. His body was returned to Wales, where he was buried in the cemetery at St Martin’s Church. The poet, who died from pneumonia, brain swelling and a fatty liver (why have one COD when you can have three?) has a small, tasteful cross bearing his name. It seems a little less grand than expected for a writer of his talent, to be honest. Caitlin, his wife, is buried with him and her name appears on the opposite side of the cross. Built in the 13th Century by the de Brian family, the castle is located on King Street. Dylan Thomas worked in the castle’s summerhouse and produced several works there.These include ‘Poem in October‘ and the collection of short stories: ‘Portrait of the Artist as a Young Dog‘, which sounds like my kind of book, tbh. Laugharne Castle is a designated Scheduled Ancient Monument and a Grade 1 listed building. The castle offers excellent views across the Taf estuary and can be visited between April and October, or simply viewed from outside. This fetching pink mansion is a fine example of a Georgian town house and sits in the castle grounds. 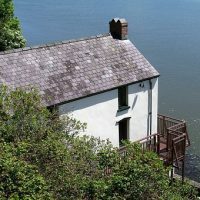 The famous Laugharne landmark is a Grade 11 listed building and was constructed in 1730. Castle House is now a private residence, although two of its outbuildings have been converted to B&B accommodation. Dylan Thomas once referred to it as ‘the best of houses in the best of places’, which is pretty much exactly what I’d be writing on my marketing materials if I was I in charge. But I’m not. Mainly because I can’t cook breakfasts and hate having people in my house. If it wasn’t for that, I think we can all agree I’d be *killing* the Bed and Breakfast game. In keeping with the Dylan Thomas theme that runs through the town, stop off at Brown’s Hotel for a drink and see why the Welsh poet was so fond of it. Famously, when once asked to provide his telephone number, Thomas gave out the number for the bar as his own. I do that all the time, too. However, Thomas isn’t the only famous face to have visited the pretty town hotel. It has also played host to iconic duo Elizabeth Burton and Richard Taylor, of all people. Brown’s has also hosted the slightly less iconic duo of Camilla Parker-Bowles and Prince Charles. It’s only right that the Prince of Wales, despite not being Welsh, should be spending money in the country, yes? Anyway, take a break from all your sightseeing and enjoy a drink before heading out.